I’ve probably said this a gazillion times, but my absolute favorite meals since revoking vegetarianism are those that involve steak tips. I really don’t know why…okay, I do know why: because they’re delicious and the nutritional benefits of red meats have had a significant effect on my outlook on diet/lifestyle. As a kid, I didn’t eat much red meat. I can remember my mother making meat loaf with ground beef, London Broil and the occasional beef burger, but other than that, our meals were veggie, fish or chicken based. During my college years, I got it into my head that red meat was bad…evil even. Red meat gives you high cholesterol, heart disease, high blood pressure, and, to top it all off, it makes you fat. As a young woman perpetually on a diet, I avoided red meat like I avoided all things fat. I just didn’t eat it. After seeing the light and giving up my vegetarian ways, I gradually eased into eating red meat. It was tough at first…well, kind of: it was tough to get over the stigma I had put on red meat. I worried about my cholesterol and about getting sick. It was not tough, however, to actually eat the red meat. My first taste of steak in probably eight years was at M’s father and stepmother’s house– we ate homemade, grilled steak tips…and my life hasn’t been the same since…it’s been much more awesomer. Seriously…and I’m being serious: I have to consciously limit my red meat intake or else people might think I’m insane. 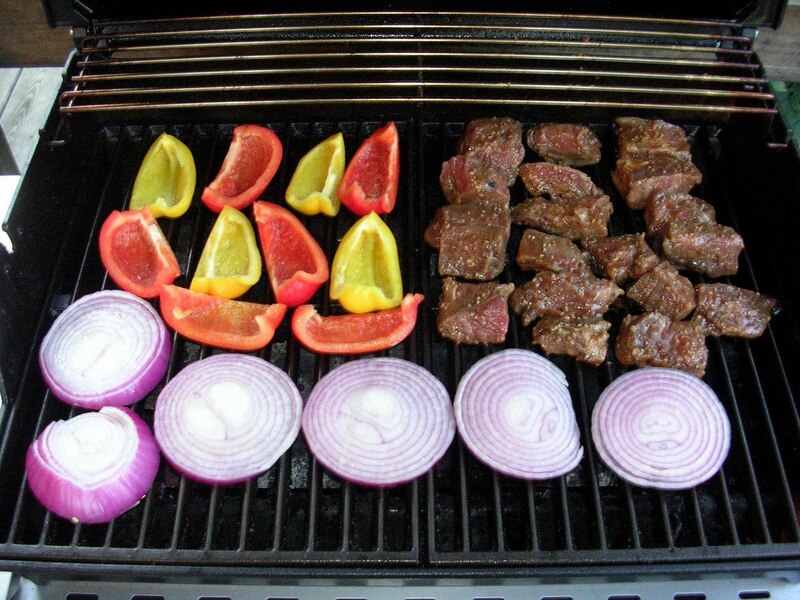 I would eat steak tips five days a week if I knew I wouldn’t get sick of them. Eating red meat has made me feel vibrant, nourished and satisfied on levels that eating a vegetarian diet didn’t. I’m assimilating protein better, I have more energy and I’m stronger and healthier overall. While these feelings cannot be attributed to steak tips alone (I do eat lots of vegetables, after all), I feel as though eating a variety of animal protein, including red meat, has completely changed me–body and soul. Of course, there are still people out there that will purport that red meat is evil. That it gives you colon cancer and Alzheimer’s. I am now of the school that believes that red meat alone is not responsible, but the Standard American Diet (SAD), which includes too many refined carbohydrates, sugars and “food-like substances”, is. As Joshua Rosenthal says, “nutrition is a fledgling science.” There will always be conflicting studies and ideas about nutrition. The important thing is to experiment and find out what works for you, individually. Are there any foods or food groups that you consider “off limits?” Do you still avoid these foods or have you integrated them back into your diet? Haha funny how you have become such a carnivore! I also love steak but red meat is not something I eat very often, unless I go home to my parents house! I do not eliminate ANY foods completely though, except artificial stuff or HFCS!! I am not a vegetarian, and I don’t restrict red meat at all. However, I’m just not a huge fan of steak! You might think I’m crazy for saying this, but I prefer a juicy cheeseburger over a steak!